Most of the digestive tract is protected by a mucous membrane. Any factor that causes erosion or the wearing away of this covering can cause an ulcer to be formed at that spot. During the process of digestion various gastric juices are produced and if these are secreted in excess or if they come in direct contact with a part of the digestive tract, which is worn out, as mentioned earlier, then an ulcer can be formed. The most common symptom of an ulcer is upper abdominal pain just before mealtime as the digestive tract is empty of food and the digestive juices may hurt the ulcer directly. The most important treatment is to see that you eat frequently. Do not allow long gaps when the stomach is empty and drink plenty of water. Some more specific causes and treatments are as follows: Chilies and spicy food increase acid secretion in the stomach so they must be avoided or reduced to a minimum. Cigarette smoking damages the mucous lining and can cause increased acid secretion and also inflammation of the ulcer, so it must be avoided. Tobacco chewing also causes wearing down of the mucous covering and will have to be given up. Frequent consumption of coffee and tea can be a causative factor and must be avoided or restricted to only 2 cups altogether, in a day. Alcohol also can cause and aggravate ulcers so it is recommended to be stopped completely if the ulcer is chronic i.e. persisting and recurring. Prolonged use of steroid drugs as well as painkillers like aspirin, brufen, etc. 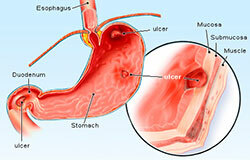 on a daily basis can cause ulcers by damaging the mucous lining. Finally, mental tension or not being able to ‘let off steam’, brooding and frustration and inner resentment regarding family matters, relationships and workplace problems, can be the basis for ulcer formation. However peptic ulcers has been seen to be one of the conditions that best responds to diet modifications. Regular frequent meals and snacks is the best and most important treatment. Breakfast, lunch and dinner timings must not vary widely. (Working people must be careful). Between these 3 meals there should be a midmorning snack (a fruit),tea time milk (milk/buttermilk plus biscuits) evening snack( a fruit at 6 or 6.30pm.) and a bed time milk. Milk has been seen to have the most soothing effect in treating peptic ulcer so it should be had with breakfast, then in the evening snack as milk or in a milky tea and then a glass of milk at bedtime too. Almost all other foods may be permitted in moderation except chillies, spicy food and sour food, specially, unripe citrus fruits must be avoided. Oil and ghee may be used lightly in cooking but fried food must be avoided as they are difficult to digest. Rich meat dishes and meat soups also are best avoided. Finally plenty of water 2-3 liters at least must be consumed throughout the day to keep the acid levels in the digestive tract low.